Red-hot Racers forward Michael Ireland, fresh from his hat-trick in last weekend’s win against Sheffield Steeldogs, believes that to keep their Scottish National League unbeaten run alive they must take their chances at Paisley Pirates tonight. 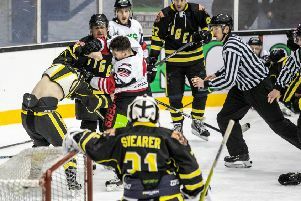 Racers edged a 4-3 thriller when the two teams met at Murrayfield earlier this month, and the Edinburgh club should be full of confidence travelling to Braehead Arena following their fine win against Sheffield in what was their final National Ice Hockey League North Cup group game. It was also their first points in the competition. In a busy weekend for the club, Racers return to Murrayfield tomorrow for the first leg of their Scottish Cup semi-final against their big rivals Kirkcaldy Kestrels (face-off 6pm), and Ireland continued: “It’s getting to the stage of the season where every game counts, we just need to keep this winning streak going. That said we can’t afford to get ahead of ourselves and need to take things one game at a time.